arlier this summer I talked to local printmaker, Mary Bruno, of Bruno Press right here in St Joseph, about helping me with the posters for this year’s Bouja. I had wanted to work with her last year but the time got too condensed. 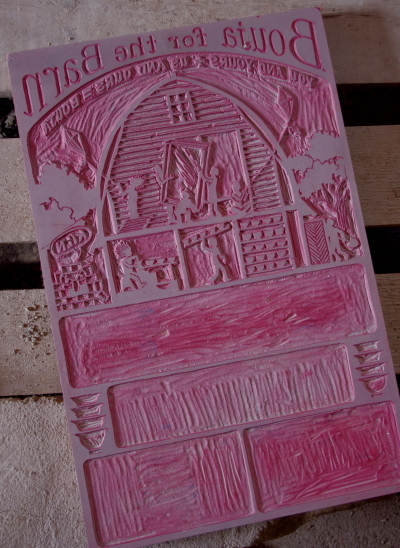 So she sent me home with a big ol’ block of linoleum to carve and when I finished it recently she graciously welcomed me into her studio to print some posters. 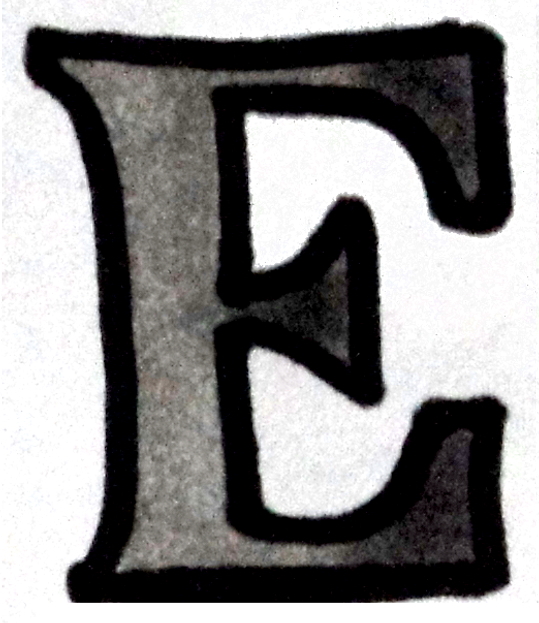 After mixing up the ink and aligning the block just right to hit the paper evenly and square, Mary cranked out a few on her Heidelberg press to make sure everything was kosher. I was shocked at the press because it re-inks your block in the same motion as it prints. When everything was set up, Mary let me give it a go, and let me tell you, it was a blast. 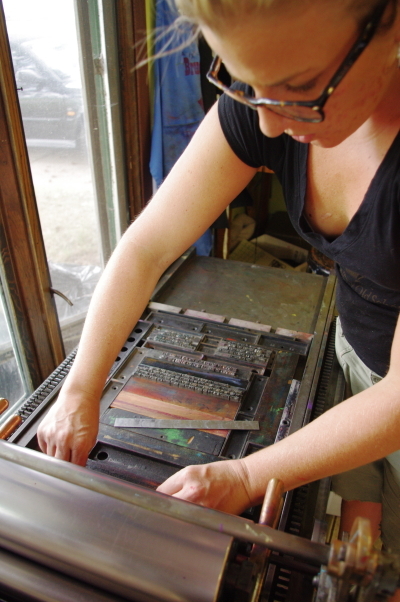 When the red lino-cut was printed, we had to take the rollers on the press apart and clean them before loading it with black ink for the lettering. 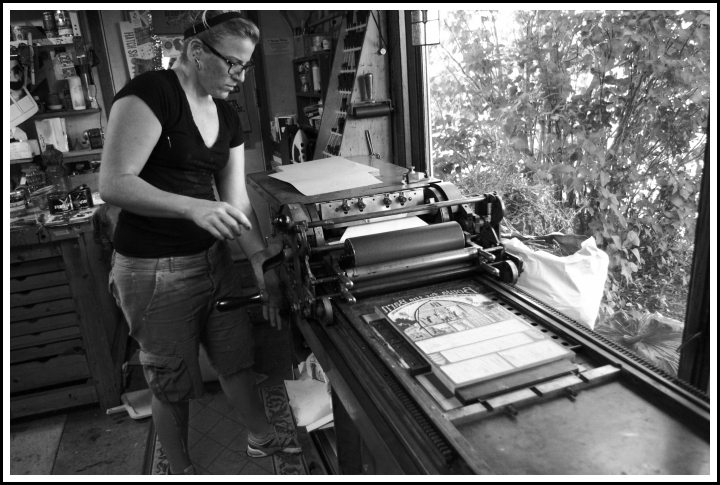 Mary set up the type on the press bed, lined it up with the lino-print, and we ran them all through one more time. To get to be a printer for a day with Mary was great fun, and I would strongly encourage you to check out her fantastic cards, prints, posters and more on her website: www.mcbrunopress.com as she does beautiful work and has a glorious sense of humor. 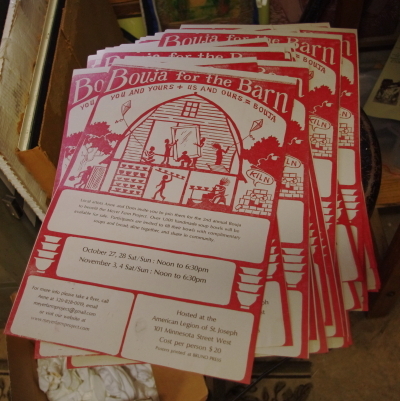 Look for the posters hanging around St Joseph and St Cloud and come to the Bouja with friends!